Derby County midfielder Jamie Ward has pulled out of the Northern Ireland squad after complaining of tightness in his troublesome hamstring. The 26-year-old was set to join Michael O'Neill's squad for the friendly against Malta in Valletta on Wednesday. Ward only recently returned to first-team action after three months out with a hamstring problem. 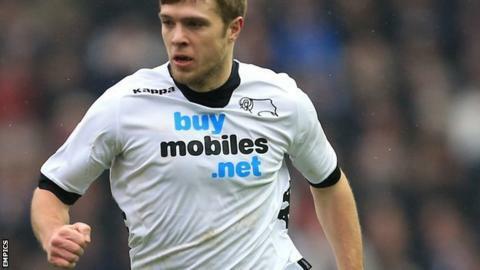 He scored in Derby's 3-0 win over Huddersfield on Saturday, before the injury forced his late substitution. Ward will remain in Derby for treatment and and the club hope he will recover in time for next Saturday's Championship game at Sheffield Wednesday. Rams coach Andy Garner said patience was key for Ward, if he is to return to his best this season. "Wardy has been out long time, but now that he has had a few games and got some minutes, he is benefiting from it," Garner said. "He looks a lot fitter, especially against Huddersfield he looked a lot sharper."